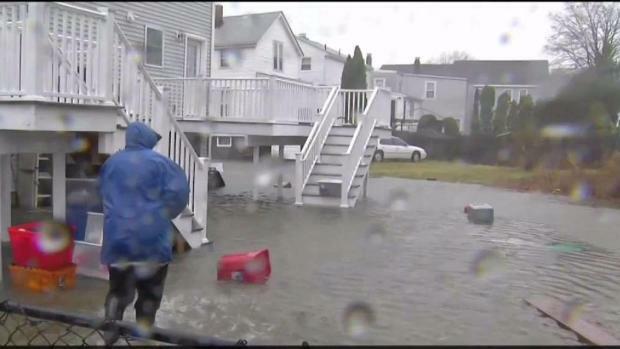 Friday's nor'easter created flooding issues along New England's shore. Communities in Massachusetts are declaring state of emergencies as residents across the state lose electricity during a fierce early March nor'easter slamming New England with torrential rain, heavy wind gusts, coastal flooding and snowfall. State of emergencies have been declared in Marshfield, Duxbury and Scituate, where officials had long-warned of coastal flooding due to high tides. The neighboring town of Norwell also declared a state of emergency after nearly 100 percent of its residents lost power. Meanwhile, first responders and National Guard members have been rescuing residents stranded by high flood waters in communities across the state, with at least 50 in Quincy. 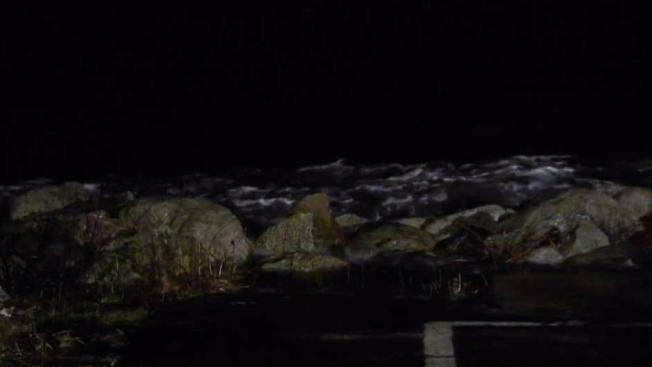 As high tide returned around midnight, flooding ramped back up in some coastal areas. Police in Sandwich say Route 1A was flooded by several feet of water, impassable for any type of vehicle. The road was closed to all traffic. Revere Beach Boulevard in Revere was also closed, as was Plum Island Turnpike in Newburyport. 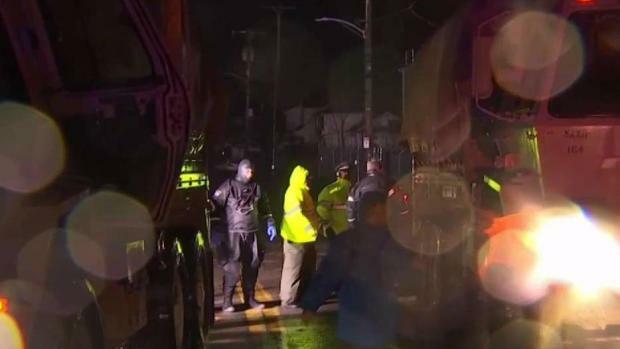 Rescues continued into the night in Quincy, Massachusetts, where people were trapped by floodwaters. 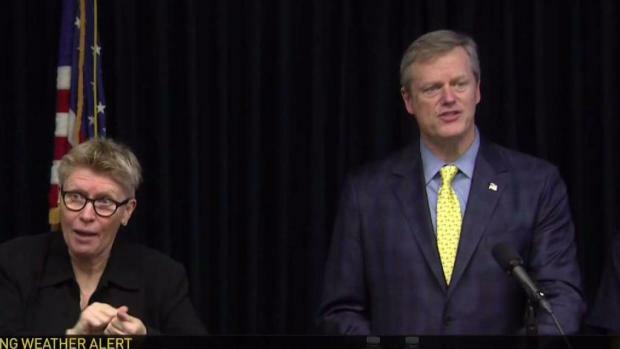 "With the next high tide hitting while most of us will be in bed, it could make for very dangerous rescue situations if people get stuck in their homes," Baker said Friday evening. Scituate Town Administrator Jim Boudreau told reporters the town rapidly lost power Friday evening. "At 5:00 p.m. we had 500 to 600 homes without power. As of right now, effectively 100 percent of the homes and businesses in Scituate are without power. That's over 8,100 homes and businesses," Boudreau said. Boudreau urged town residents to stay in their homes. "Not safe for people to be on the road in Scituate right now. You need to stay home. You need to stay off the roads," he cautioned. 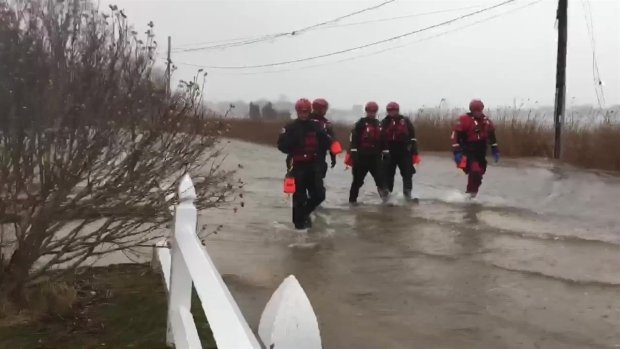 Rescue crews in Duxbury, Massachusetts, had to get through floodwaters to keep people safe. Boudreau added that restoration of power will not take place until the winds die down. The massive waves were sent crashing over Scituate's seawall by mid-morning, one of two communities where officials had asked residents living along the shoreline to evacuate. "This will certainly be one of those benchmark storms that we look back on and say that was a huge event," Joe Rossi, a flood specialist with the Massachusetts Coastal Coalition, said. The powerful storm was testing the community for the second time this year. A storm on Jan. 4 proved too powerful for the seawall, flooding streets, homes, and vehicles. "I literally just sat in my room and watched the whole ocean go from one side of the seawall to the other," said Scituate resident Parker Gorton. Parker and her family rode the January storm out in their home above a market on Turner Road. On Friday, that store was closed and they were forced to evacuate with other residents like Michele Wood. 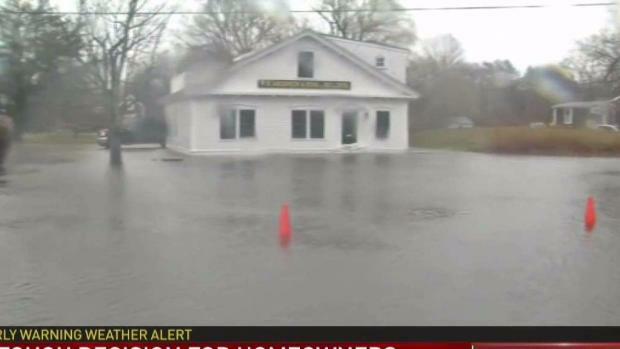 Flooding concerns in Gloucester as nor'easter hits. "We gotta get out while we can or else we’ll be stuck here for two days," said Wood. Meanwhile, Quincy Mayor Tom Koch said this nor'easter was hitting the city harder than the recent January storm, and was leaving an impact closer to the 1978 blizzard. At least 50 people were rescued, and thousands were without power, he said, adding that while he wasn't ordering mandatory evacuations, he was concerned about what the storm will bring overnight. "We have creeks and rivers and brooks throughout the city that feed down into the basins that feed into the ocean." Koch explained. "Those basins are usually opened up once the tide goes out to release the water. We're not able to do that because the tide has not gone out far enough. We've got people in low-lying ares that should be very careful tonight." Quincy Police Chief Paul Keenan noted there were many houses that suffered wind and water damage, and said that officers rescued families on Post Island Road, including a police officer's wife and seven children. "Adam's Shore, Post Island area, the water reached the first floor, so that's where most of the evacuations took place," Keenan said. "We used rafts, boats, and front-end loaders." 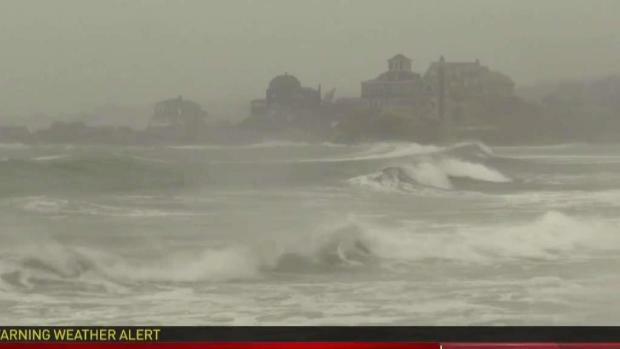 As storm moves through the North Shore, residents in Revere are moving to try and avoid flooding damage to their homes. In Duxbury, where shoreline residents were also asked to evacuate before a state of emergency was declared Friday night, major flooding was also reported by mid-morning. It continued to be a problem into the evening. Fire officials in Duxbury said they were fielding hundreds of 911 calls, with trees having fallen into power lines across town, and warned residents not to drive through the water after having to rescue someone from their vehicle. While the south coast got battered by whipping winds, heavy rain, and flooding, some North Shore residents were also taking cover. Homeowners in Sanwich contemplate evacuations as strong nor'easter causes rising waters. 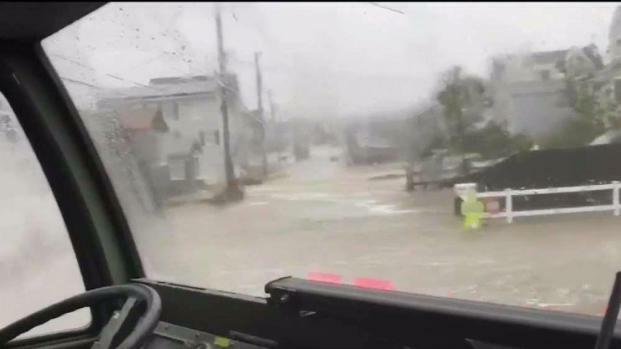 Firefighters in Gloucester brought in the Army National Guard and high water vehicles and urged residents to self-evacuate. "The bigger concern is really the wave action coming on shore," Gloucester Fire Chief Eric Smith said. "For all our easterly facing coastline, there are structures at risk and these waves can take houses down, take properties down." Steve Cogswell was visiting Plum Island and told NBC10 Boston that the rain was forcing him to leave the area. Technical rescue teams going home-to-home to check on people on the Duxbury-Marshfield line on Plymouth County. "We are probably going to be underwater here pretty soon tonight, midnight, but I’m not going to be back here at midnight," Cogswell said. However, some homeowners said they weren't too worried. "We've had some siding go and that sort of thing, nothing too severe," said Dave Rardin. "There's a sandbar out there and they repaired the jetty and did some dredging and it made all the difference in the world."